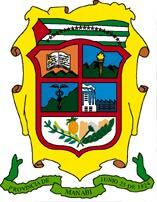 Manabi is a province in central coastal area of Ecuador in Costa region. Capital is Portoviejo. According to <members.es.tripod.de/manabidatos.html>, there are 21 stars forming an arc and not 8 forming a circle. As those 21 stars represent the number of "cantones", maybe we can guess that the number of them have increased to reach now 21 but it's only a guess. 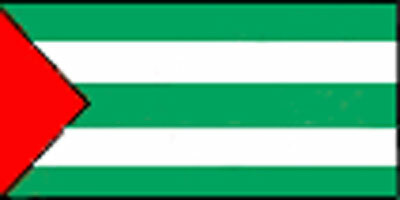 "The Flag has the proportion of two by one, divided in five equal bars or stripes, being three of them, superior, inferior and central, green color, and the remaining two white. In addition, it will consist of a red triangle, whose base will be the spear of the emblem and its height the one that is obtained to an angle of 60 degrees. The vertex of the triangle will agree exactly with half the wide of the Flag. Outside the triangle, in semicircle, there will be 21 red stars, that symbolize the 21 Manabites cantons and their provincial unit, the same ones that will be incorporated as new cantons are created. The distinguishing colors of the Province of Manabi will be green, white and red, that symbolize: The green one, the Manabite earth fertility; the red one, the generous blood spilled in the libertarian and reformists deeds of General Eloy Alfaro; and the white one, the peace and work that yearns our town for its progress and exaltment." At <www.geocities.com/clgonza> there is a (simplefied ?) variant without the stars. There are twelve red stars in a circle .